I found your site about a month ago and I have finally finished all the archives...well except for the "Kitchen Garden"
I really enjoy your stories and pictures! ...Oh, and the recipes too!! I heart your heart theme. Great pic. When I buried my precious Cardigan dog and was building the rock cairn, what shape should find its way to the top? What a super collection of unique rocks. What fun to be able to find them. I love those! We love rocks..ok..sounds weird but we do..
they are all over in our yard, just another fabulous part of nature :) great photo. 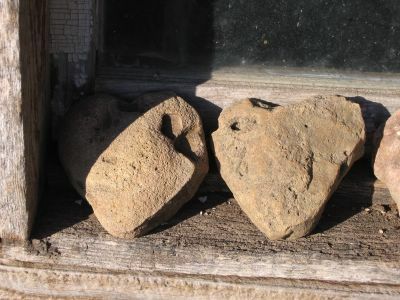 Yes, I love heart rocks too and have collected a few. I just discovered your blog--thankfully. Like Rebecca, I'm working my way through your archives, and I'm loving every minute of it! Thanks for transporting me with your fantastic photos.